How sad! Why do not the TV's in Christian countries celebrate Jesus birth with joy and happiness? ZDF showed a lovely German Christmas program with hostess talking with guests, children singing carols and all kind of nice cliches. Some stations showed movies somewhat related to Santa Claus and his folks. Lebanese Christian stations had Arabic style holy music, slow almost funeral style songs. Trinity Broadcasting was overwhelmingly American. It was quite depressing, really. Plastic Christmas, Santaclaus cult, repeating programs with candles and other attempts to reach some sort of atmosphere. 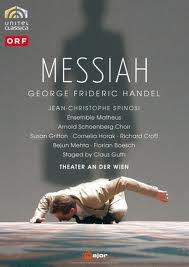 Absolutely heavenly music and a most strikingly human play in Vienna during Händel's 250 year celebrations. 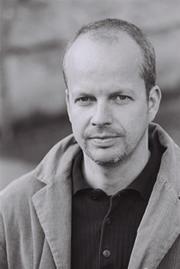 Claus Guth (b. 1964) has directed a totally fresh Händel's Messiah which an impeccable gang of musicians and dancers performed to perfection. Susan Gritton, Cornelia Horak (sopranos), Bejun Mehta (alto), Richard Croft (tenor), Florian Boesch (bass). Arnold Schönberg Choir, Jean-Christophe Spinosi conducting Ensemble Mattheus. Perfecto. Paul Lorenger dancing as symbolic Christ. Unforgettable. Nadia Kichler talking in sign language as symbolic angel Gabriel. Angelic. The singers, choir and orchestra out the brilliance of Händel's masterpiece in such a nuanced and committed manner that I do not expect this performance to be surpassed anytime soon by anyone. The Messiah in Vienna was an absolutely amazing performance and I have never seen anything like it. I will never forget the singing of Hallelujah in that funeral. A true encounter with the true Messiah through the Word of God, music and acting. G.F. Händel would have enjoyed this performance enormously. Messiah for today's wicked and adulterous generation. Sorry to confess, but strangely the Mezzo TV showing Messiah with contemporary message somehow felt much more genuine Christmas event than the Midnight Mass from the Nativity Church seen on another channel with cameramen concentrating on the faces of the important politicians present in Bethlehem 2012. This is not secular Messiah as some critics would define it. Rather, this is the kind of theology that Dietrich Bonhoeffer was talking about as Alfred Eaker has noted (though he wrongly calls it "humanizing Messiah" - Isaiah 53 is very human).